Cold and flu season is here, and that means you or someone you know is wondering if those vitamin C supplements are worth it. We all want to avoid getting sick if we can and most of us are willing to do just about anything to do that. Vitamin C is definitely a beneficial part of your diet and supplements can be helpful, but there are a lot of foods you can eat to meet your vitamin C needs. Vitamin C is an essential vitamin, which means your body doesn’t make it and you have to get it from food. It plays a role in strengthening your immune system, as well as tissue growth and repair, wound healing, and keeping your skin, teeth and bones healthy. Vitamin C is also an antioxidant, meaning it helps keep free radicals (potentially harmful substances) in your body in check. This means vitamin C can play a role in preventing or managing chronic diseases like heart disease and cancer. As far as cold fighting goes, vitamin C won’t cure your cold or flu, but getting in enough every day can help keep your immune cells healthy enough to fight those germs off faster when they do strike. You might think your best bet for getting in enough vitamin C is eating a bunch of oranges, but you’d be wrong. 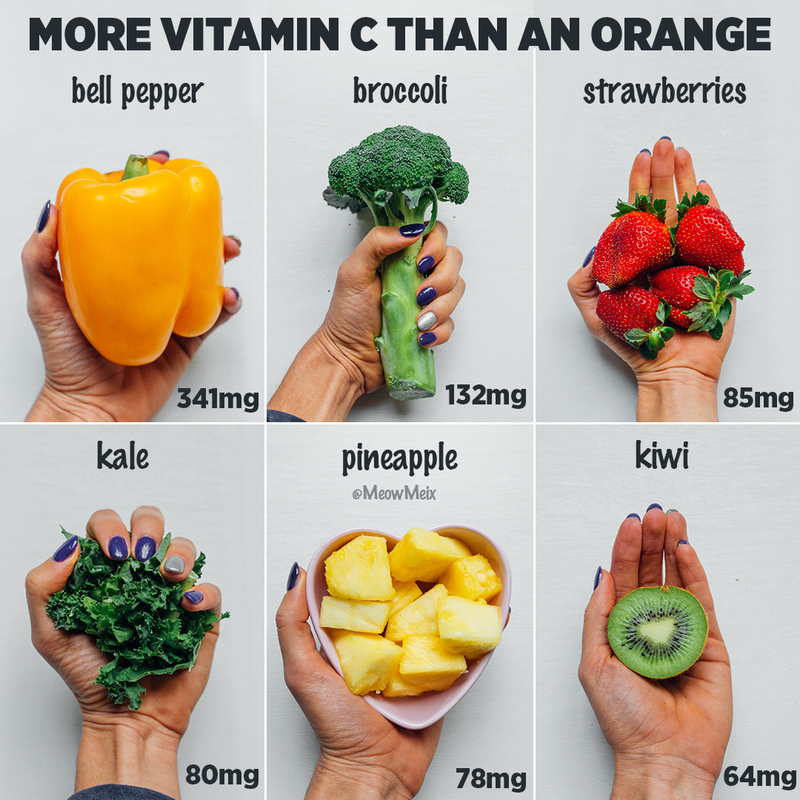 The recommended intake of vitamin C for adults is about 75-90 mg/day (studies show up to 500 mg/day to be beneficial) and a small or medium orange has only about 50-70 mg of vitamin C.
Vitamin C is great, but make sure you’re protecting your immune system in other ways, too. Washing your hands, drinking lots of water, eating healthy, and getting enough sleep are also important parts of a strong, healthy immune system. Another quick note, when it comes to vitamins more is not necessarily better. Vitamin C is water-soluble so toxicity is rare, but you’ll pee out whatever your body doesn’t store, so taking more than 500 mg/day is kind of pointless. For more healthy living tips and delicious recipes, make sure you subscribe to my newsletter and follow me on Instagram.